Cucina Povera: Dulce Dulce Dulce! Dulce = sweet in Italian. Sweet things are not really what one should eat at lunchtime, but I like to make exceptions to the rule. Plus, I didn't expect an experiment to turn into my lunch! I think Winter is making me want all things naughty, nice and deep fried. 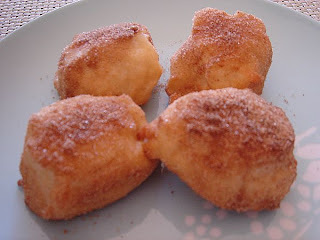 Ricotta Doughnuts sprung to mind. I had never made them before and had no recipe so I did a little Internet searching. There are many recipes out there for these doughnuts - but not so many for such a meagre amount of cheese. I had to do much converting and a little experimenting - Here is the version I came up with. Heat oil in a small saucepan (about 2 inches of oil in pan). Mix cheese, sugar, eggs and vanilla together. Sift in flour and baking powder. 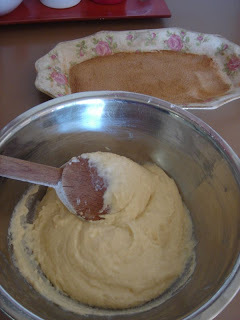 Fold to make a smooth batter. 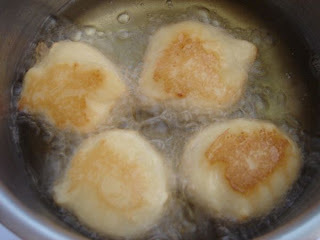 Drop teaspoons full of batter into the hot oil. Do not overcrowd the pan. The doughnuts will initially sink to the bottom, then puff up slightly and rise to the top. Turn and cook until golden. Remove from oil and roll in cinnamon and sugar. Eat while hot! This recipe easily makes enough doughnuts to satisfy a sweet craving for two people. If dining solo, you can keep any left over batter in the fridge to make more later. 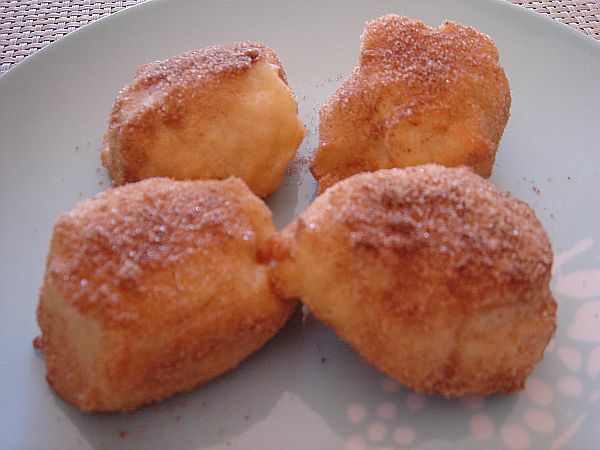 With a little further experimentation, I am sure this recipe would respond well to tweaks - like adding orange zest to the batter, or a chocolate or caramel dipping sauce to accompany... You are only limited to your own taste and imagination!